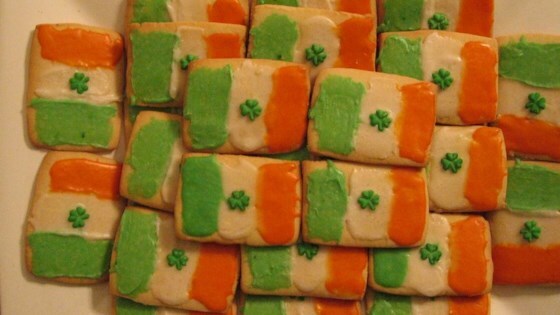 "Crisp sugar cookies frosted to look like the flag of the Irish Republic." In a large bowl, cream together butter and confectioners' sugar. Beat in egg and vanilla extract. Mix well. In a medium sized bowl, stir together the flour, baking soda and cream of tartar. Blend into the butter mixture. Divide dough into thirds and shape into balls. Working with 1/3 of the dough at a time, roll out dough to 1/4 inch thick on a floured surface. With a knife, cut dough into rectangles about 2 inches high by 3 inches long. (6 x 8 cm). Place rectangles on an ungreased cookie sheet, 2 inches apart. Bake in a preheated 350 degree F (175 degrees C) oven until lightly browned. Cool completely on wire rack. Frost cookies with Irish Flag Frosting. Make a 1 inch green stripe on the left side of the rectangles and a 1 inch orange strip on the right side, leaving the middle one inch unfrosted. Dough was very easy to work with. Cooked 10-12 min on an air-bake pan. The flags were adorable-took to a St Patty's party so I made mine a little smaller than the recommended 2x3. Delicious. The cookies weren't very tasty and frosting the cookies wasn't as easy as it looked. I tried using a brush and then a butter knife, but then just gave up. This recipe was very fun to make and very delicious! These are the best-ever sugar cookies and are a great dessert for st. patrick's day. My 3 and 5 year old had so much fun helping me bake and decorate these cookies. So cute and yummy! Very good. Simple icing. Use cookie cutter for seasonal cookies. Good, fast and real easy, tasty things had to beat people away just so i could frost them!